Welcome: Welcome, welcome, to Summer Theatre. Summer 2008 will mark our 43rd season. Can you believe it, 43 years! A lot has happened over those years. We have performed in a tent, in McFarland Auditorium, in the park, in Rugby and Garrison, in the Aleshire Theatre, and of course in the Amphitheatre. Hundreds of students and community members have performed on those stages in hundreds of performances of the best broadway musicals and comedies the world has known. Through it all our greatest source of pride comes from the encouragement and support you have shown for the past 42 years. Detectives, Dames, Deceit, and Jazz. ..and enough gunshots to keep your heart racing and your fingers tapping. 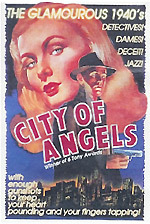 City of Angels tells the story of the mild-mannered writer Stine working on his screenplay about the detective Stone, who sidles through a Hollywood netherworld of vicious thugs and femmes fatales.The juxtaposition of real life and "reel-life" occurs on a number of levels as Stine weaves the people around him into his characters on the big screen. City of Angels is a deliciously funny spoof of 1940s film noir and hard-boiled detective fiction that will keep you guessing. Produced through special arrangement through Tams- Witmark. Much Ado About Something! William Shakespeare's most famous fairies, Oberon and Puck, have magically materialized on the Hollywood set of A Midsummer Night's Dream. Instantly smitten by the glitz and glamour of show biz, the two are ushered onto the silver screen to play (who else?) themselves. With a little help from a feisty flower, blonde bombshells, the Warner Brothers, Jimmy Cagney and other assorted characters, Oberon and Puck are tossed into loopy love triangles with hilarious results. 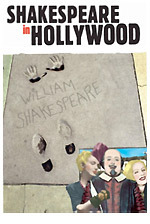 This script by Moon Over Buffalo's Ken Ludwig will have you rolling in the aisles as you watch a much different version of Shakespeare's classic play. Produced through special arrangement through Samuel French, inc.
It’s a little bit of everything! 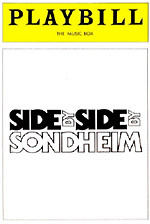 "Side by Side by Sondheim" features songs from many of Sondheim’s popular musicals, including West Side Story, A Funny Thing Happened on the Way to Forum, Gypsy, A Little Night Music, Company, Follies, and many others. Audiences are likely to recognize songs like ‘Send in the Clowns,’ ‘Comedy Tonight,’ and West Side Story’s ‘Tonight.’ Side By Side is a musical extravaganza that everyone will enjoy! Produced through special arrangement through Music Theatre International. Kiss Me, Kate is a multiple Tony Award winning musical that was most recently revived on Broadway in 1999. The production tells the story of a theater troupe preparing to open a musical version of William Shakespeare’s Taming of the Shrew. However, the lead actress and actor are celebrating the one year anniversary of their divorce and are barely speaking with each other and the success of the production is threatened by a fight on opening night and two thugs who believe Fred owes their boss money show up and somehow the show must go on. 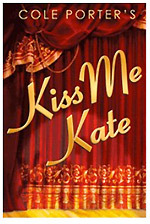 Kiss Me Kate features such timeless classics as "It’s Too Darn Hot!," "Brush Up Your Shakespeare," "Why Can't you Behave," and "Another Openin’, Another Show." Produced through special arrangements with. Tams-Witmark Music Library, Inc.